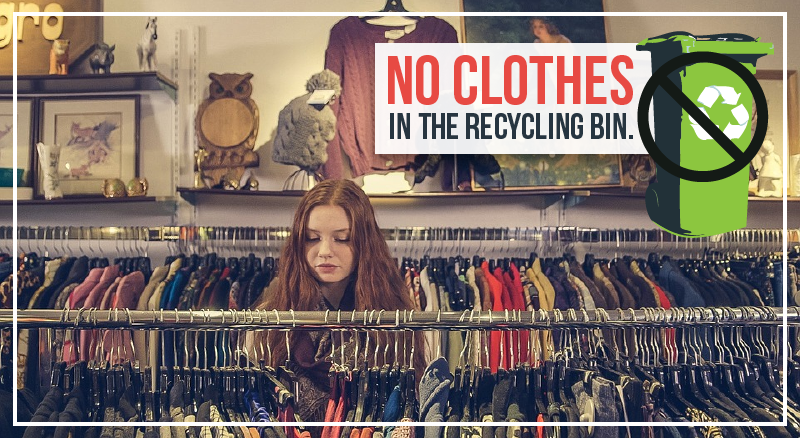 Clothes, Bed Sheets and other types of Fabric are NOT recyclable… However, you can “Re-Use or Donate” these types of textiles (clothing, blankets, bedding, towels etc.). Fabric gets caught in the recycling equipment and causes major problems at recycling facilities. If you throw clothing or fabric in the bin, you’re creating more work for the people who have to physically pull it out. Usually clothes get so damaged or contaminated from the waste truck that they have to be thrown away after being pulled out. So please think of the recycling workers and make their jobs easier, keep your fabric and clothing out of the recycling bin. What to do with Clothes or Fabric? Donate to one of the many community organizations, charities or thrift stores in our area. Check out this list from the local best for some ideas. There are 0 comment. on "ReUSE Clothes….Do Not Recycle"